Instead of writing about estate administration in ‘lawyerly’ terms, we decided to write about It’s Always Sunny in Philadelphia, the twisted FX comedy that just finished its long run. The best description of the show: horrible people acting horribly every minute of every day. The ex-wife and mother of three of the show’s major characters has died and they are in a lawyer’s office anxiously waiting to hear what the will has to say – there’s quite a lot of money at stake. The ex-husband, Frank (Danny DeVito) is told he’s been left nothing. As a matter of fact, all of her cash, taken from Frank in divorce, has been left to another man. The lawyer moves on, the son, Dennis, gets the house (on the sole condition Frank never be allowed inside). The daughter, Deandra, gets nothing. Dennis nods along knowingly, “Yeah, you did!” And leaves the room. It’s really funny . . . because it’s a simple will and it’s incredibly straightforward. No ambiguities here, the mom laid it all out, including why she was disinheriting people. When we were kicking around a few ideas for a post about administering an estate, this scene kept coming back to us. Because, simply, the scene losses it hilarity when it comes to making decisions for an estate that’s not as cut and dried as Dee and Frank’s mom’s is. There are usually at least a few decisions that have to be made by the executor of an estate. Few of them are cut and dried – for the simple reason that anyone administrating an estate has to consider (a) the wishes of the deceased, regardless of how vague or contradictory they may look on paper; (b) the best ‘business’ decision to satisfy their fiduciary duty(s); (c) what’s fair. Those aren’t always compatible and the decisions that need to be made don’t easily fit into any one box. 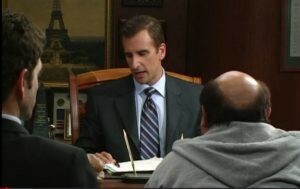 Which leads to real conversations like the one from It’s Always Sunny, without the executor having the ‘easy out’ of explaining, “It’s not me . . .”. Look at Prince’s estate. We wrote about it a few weeks ago. The court appointed administrators of the estate have to try to figure out “What Prince would have wanted” while trying to sell assets, run the businesses, enter into contracts, manage the properties (and much more), while balancing what the heirs want/need even while they – the heirs – don’t get along very well among themselves. Every decision must be backed by sound legal/business logic. Every time a decision by an administrator is challenged, the estate loses by having to pay legal fees. It is a juggling act, one that doesn’t lend itself to great comedy bits. By the way, even with a simple will, there’s a ton of paperwork, a ‘will reading’ is a great scene for movies and TV but it doesn’t really happen that way in the real word. It’s so much more complicated.